While the weather is not that great at the moment, im not going out to places & hate just sitting in front of pc or tv on a evening, so when i was in hobbycarft few weeks ago with a friend lol, I got a few of their own make of the 3D wooden puzzles as they were on offer around half price. Normal prices from around £2 -£10 depending on the size of the model and the complexity. I had brought one of these woodcraft construction kit’s last year of a Harley Davidson motorbike, this one was around the £8 mark and a small airplane model at around £3 aswell. I did enjoy making these models the small airplane only took around 30mins to do, but the Harley Davidson motorbike did take me alot longer I would estimate around 4 hours over few evenings. If you don’t know what these models are they are wooden 3d puzzles /models, you get normally 2 sheets of wooden boards that you pop out the precut shapes, you have the picture on the front of a sheet that comes with the model on the back of this sheet you see the layout of each board supplied with numbers on each shape you have to match the number on one piece to the number on another piece. It does sound easy but trust me you can be pulling your hair out sometimes as no matter how much you look you can not find the other number piece and sometimes the pieces don’t fit together properly sometimes so can be a bit fiddly. But on the other-hand once you have completed a model to have a great sense of achievement. As a boy I used to love doing airfix models, so thats why I enjoy doing these. Once I had completed the models I decided to varnish them instead of painting so would still show the full grain of the wood. I used three different types / colours of varnish these where just the cheap pound ones that you can pickup from these types of outlets. On that subject you can buy smaller models from these pound type shops, but to be honest not close to the quality of the £2 ones in hobbycraft, but great for kids to start with. The new model I brought the other week were the Vintage car, Spitfire, Sailing boat /ship, Formula one car, merry go round (carousel), Train & small speedboat. 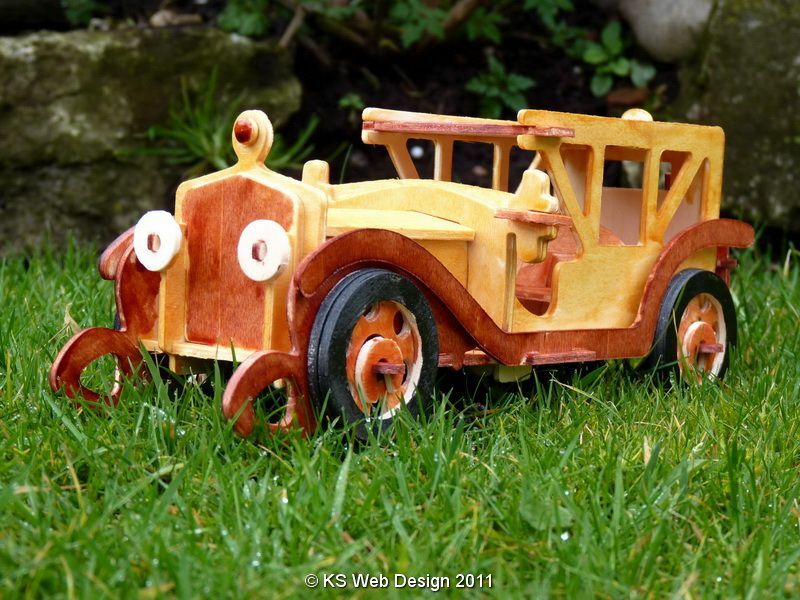 At time of writing this the only one that I have built and varnished is the Vintage car. I decided to take some photos of these completed models with some nice outdoor backgrounds before and after being varnished see the gallery below. I will be uploading new photos of the models when I have done them.